The Good: Prettiest Fallout yet! You can play without V.A.T.S. The Bad: So much scavenging. The Ugly: Multiplayer component just isn’t engaging, resulting in everyone wandering around solo. Funny story: I’ve been really busy recently – new job, doing a major addition on my house, just published my seventh novel – and when there just aren’t enough hours in the day, the thing that drops off the calendar for me is gaming. I don’t do it, and more significantly I kind of stop reading about it. 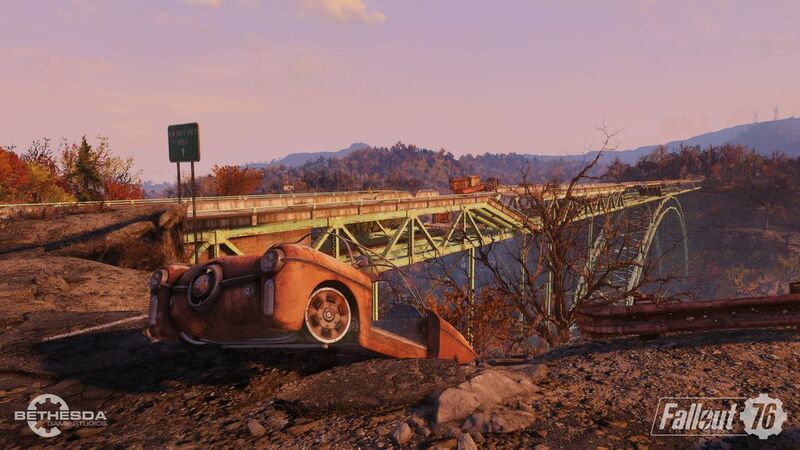 So, when my editor contacted me to review Fallout 76, for some reason I thought it was a remake (or reimagining, or reboot, or whatever they call such things these days) of Interstate 76, the Mad Max-esque driving and shooting game, instead of a Fallout multiplayer game. Imagine my surprise when I started playing it. 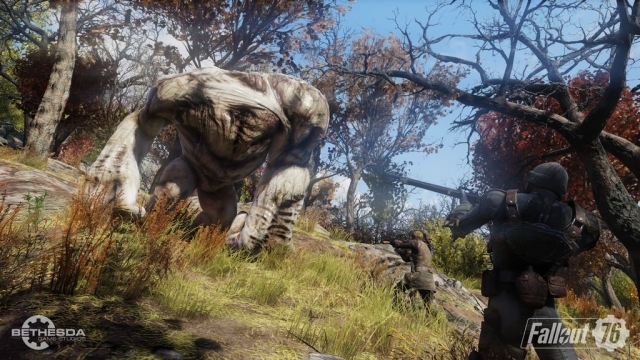 Anyway, having a couple of dozen hours into it now, Fallout 76 is difficult to pin down. The setting of Appalachia is beautiful. 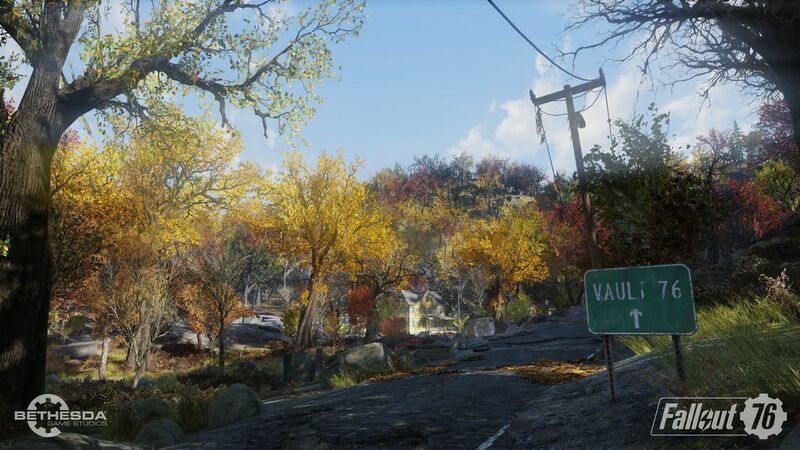 It is fall in Appalachia, and this gives access to a palette of colors far beyond the muted grays and browns that the Fallout series has thus far been famous for. Sure, there are mutants, moles the size of schnauzers and whatnot, but the farms, looking more abandoned than nuked, are peaceful and verdant. The V.A.T.S. is still there, but the combat feels more real-time, and the iron sights on the weapons feel more certain, and I’m less inclined to use it. 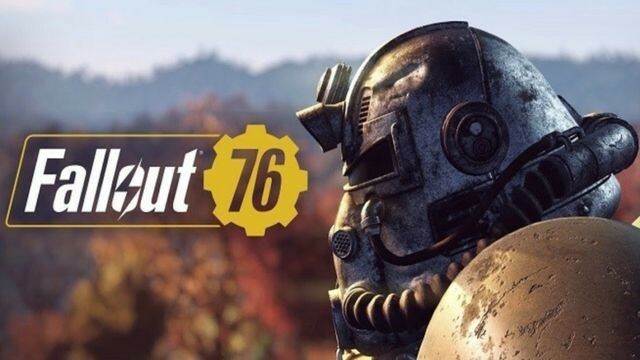 But ultimately the big change, and kind of the whole purpose for F76, is the multiplayer component, and how that plays out is going to depend a lot on the community, a quantity that I believe is still very much to be determined. We get a lot of divergent views about what our post-apocalyptic dystopian future might look like. The Walking Dead shows us clumping up in little communities for survival, Buck Rogers in the 25th Century showed us building new, futuristic cities on the rubble of the old and forcing everyone to wear spandex, and our future existence in the world of Fallout has been particularly bleak, in that pretty much everyone you meet wants to kill you. 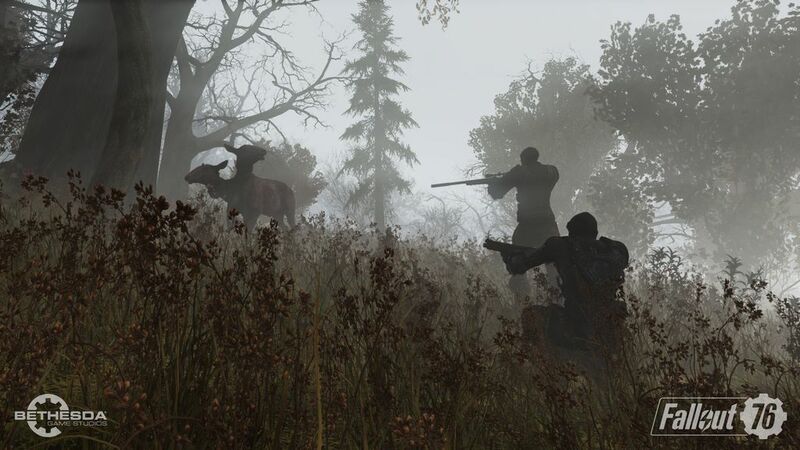 F76 multiplayer hasn’t devolved (at least thus far) into a ruthless PvP killing field. Early characters (under level 5) are isolated in that they can neither kill nor be killed (which presumably prevents wholesale griefing at the vault 76 doorway), but past lvl5, no one seems quite certain how to behave towards one another. Sure, the game tries to get you to team up with others via timed group activities, like clearing a farm of mole rats, but more often than not when I travel to the site of the objective, I find no one else there, so I do the mission myself. Or if I do find someone else there, we work essentially independently, shooting mole rats as we see them, and then the mission is over and we go our separate ways. Part of this lack of community cohesiveness is probably due to the communications interface. If you have a microphone, you can use it, but lacking one (I don’t have one), you’re forced to use preset, big, cartoony hand gestures, like a wave or an OK sigh with thumb and forefinger. It’s difficult to convey the message ‘let’s check out the abandoned concrete factory’ or ‘let’s go deal with the nuclear power plant in critical meltdown’ or ‘I’m a videogame reviewer and I need to shoot you to check out the PvP mechanics’ with big, cartoony gestures. Another part is due to the fact that there are limited scavengable materials, so a large group may have difficulty finding enough food and ammunition to survive. I found myself traveling down the road in the wake of a group of three or four people who were working together, and every creature I came across had already been killed and every crate and hidey hole had been looted. They presumably recharge in time, but I think limited resources tends to drive people apart. 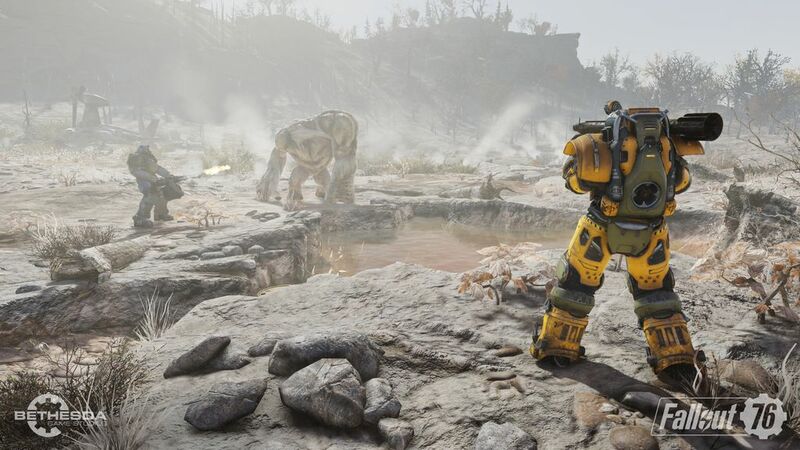 Finally – and this may be the biggest one – Bethesda only offers F76 through their own service, not Steam. I appreciate that videogame producers don’t want to give Valve a cut of everything, but my whole social network is on Steam, and when I move over to the Bethesda launcher I don’t have my friends to play with, and find myself struggling to build a new community with Bethesda. 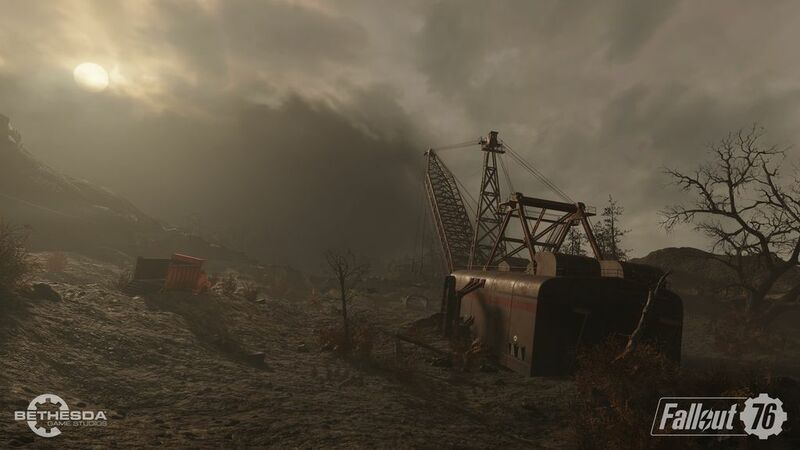 Lacking that community, my experience in F76 has been remarkably similar to previous iterations of the game. I roam alone, discovering locations, killing creatures, picking safes, crafting armor and weapons, and scavenging the great rummage sale that is Fallout: clocks and toys and typewriters and lamps and pails and bottles and clipboards and pencils and roasted deerstag and Blammo Mac and Cheese and Nuka Cola, and on and on and on. If you had enough of this kind of thing in previous Fallout iterations, there’s more of that here waiting for you. There is a mission plotline – you’re trying to find out what happened to another resident of your vault who wandered outside before you did – but it’s much thinner than in previous games, and I suspect Bethesda hoped the multiplayer would make up for it. So far, not so much. 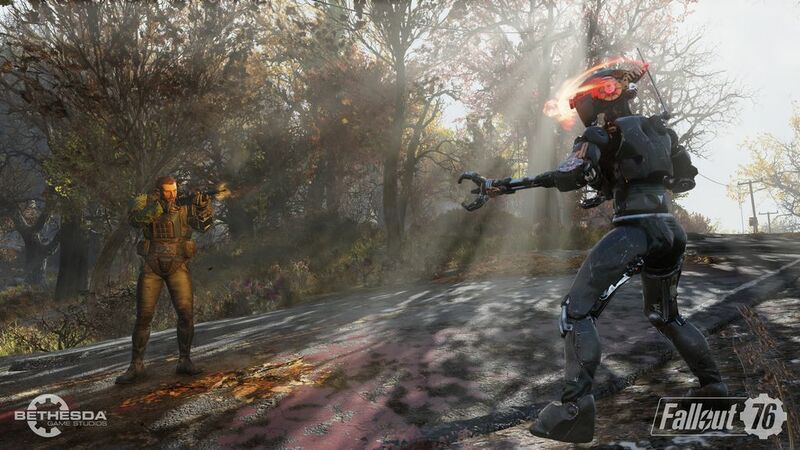 Bethesda has thrown a few other things into the mix that might turn into something interesting. For one, you have a new campsite (they actually call it the C.A.M.P. and it stands for something, but I can’t think of what at the moment). You can carry it, and set it up, and build things using it – cooking sites and workshops and defenses and buildings. This works much like a mobile version of the building sites in your old neighborhood in Fallout 4. The build menu is just as awful, and I found it supremely painful to work with, but maybe people with a higher pain threshold than I will stick with it and build things. Heck, people have recreated the Taj Mahal in Minecraft, and I don’t get that either. Anyway, I think that was Bethesda’s hope, that people would build – I don’t know, restaurants or hotels or other businesses maybe – and form a whole community in the rubble. Mostly I just sleep in mine. Another thing they’ve added is a more survival-like tilt to the game. Food and water no longer just provide HP, but now are needed to survive. 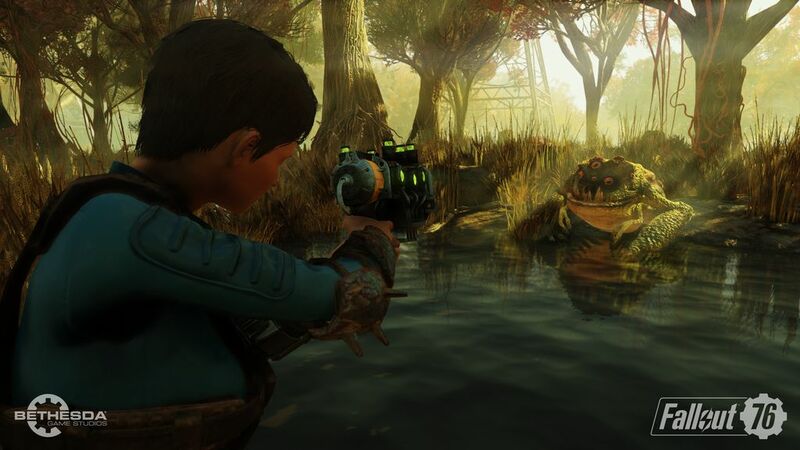 Food and clean water aren’t exactly scarce in the land, but maybe they’re in just short enough supply to get people to trade, or kill each other over it, some attempt at getting the vault survivors to intermingle. You can also now catch diseases, which makes medicine (and the ability to craft it) more valuable, so maybe people will end up specializing into doctors or armorers or weaponsmiths. 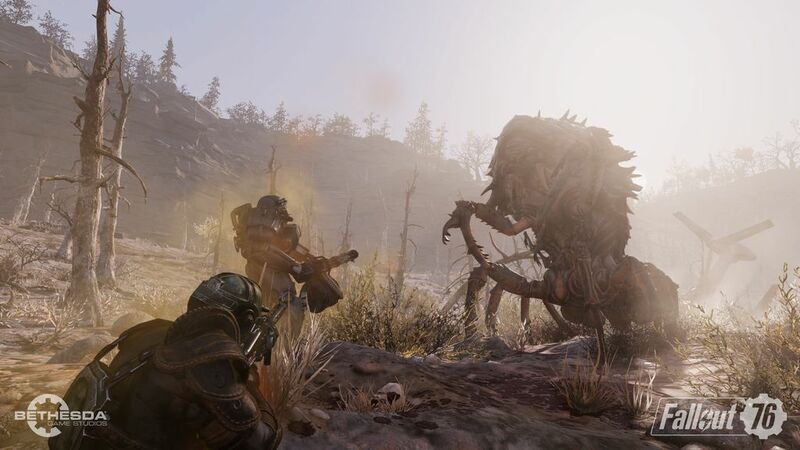 It’s also possible that everyone will get tired of roaming the wasteland and move on to other games, leaving F76 an even more a solo experience than it already it. There’s a future to this game that is far from clear standing here today. I’m probably not the type of player that Bethesda was hoping would play this game. I don’t play a ton of multiplayer games, and when I do, I almost exclusively play with IRL friends. But maybe the environs of Fallout draw loners to it. 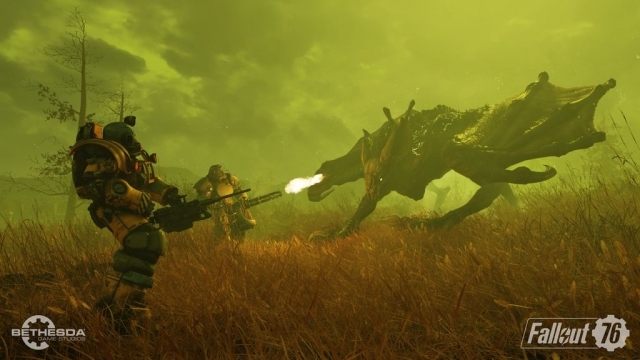 As a game that in the previous three iterations was all about solo survival in the wasteland, maybe that’s the audience this series has attracted, multiplayer or not. Here’s an experience: early in the game, when I was fresh out of the vault, I came across a farm house. Scattered around the farm house yard were dead scorched (humans who were genetically cooked by the nukes), and inside the house I found another player. I give him a big, cartoony wave. He has a microphone, and he told me (yelled at me actually) to get out, that this is his house, with a few expletives thrown in. He was kind of muttering and raving, essentially exactly what I would expect from a post-apocalyptic wasteland survivor, and then he shot at me. Being that I was a low-level character, and hence protected from PvP, he couldn’t actually hit me, but he clearly didn’t want me hanging around, and he had looted everything the house had to offer, so I left. I can’t help but feel that single engagement with another person is a premonition of things to come. This review is based on a digital copy of Fallout 76 for the PC provided by Bethesda Softworks.